The South Eastern Veterinary Neurology Group will bring together veterinary neurologists, neurologists in training, neuroscientists and neurosurgeons from the USA and Canada to enhance the understanding, diagnosis and treatment of neurological and neurosurgical disorders. Hospitality and Science ... 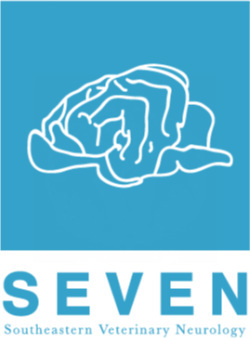 The annual SEVEN meeting will be hosted by the University of Georgia, Veterinary Medical Center, at the Athens Holiday Inn on Saturday November 3, 2018. Checking in Friday evening? There will be a complimentary social at the Holiday Inn Red Fern Bar from 5:00-7:00. Enjoy an array of appetizers and drinks with our guests and vendors. Conference sessions will be Saturday in the Georgia Ballroom and the day will end with a very special dinner at the South Kitchen & Bar. Veterinary neurologists and neurosurgeons from the Southeastern region and beyond will gather in Athens, GA for a one-day meeting to discuss the latest in neuro-imaging and the medical and surgical management of many the neurologic conditions seen in animals and people. Board certified veterinarians of other colleges are also very welcome to attend the meeting. For Hotel and Travel information, please refer to the 2018 Meeting tab.